This sturdy, easy-to-assemble fixture allows you to display a wide range of apparel in a limited amount of space. With four adjustable arms and durable caster wheels you can easily move and arrange your samples. Each fixture comes with a plexiglass sign holder and 13 double-sided branded signs that fit into the top. Minimum height: 49 and 3/8 inches. Maximum height: 70 and 3/8 inches. Arm length: 22 inches. $175 plus freight. Call to order. Advertise your brand offerings with our selection of branded signs. Signs are 11" x 22" and cost $5 each. 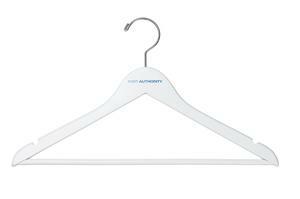 High-quality, upscale hangers provide your samples a tidy, professional appearance. Choose from twelve branded designs that include Port Authority®, Port & Company®, Sport-Tek®, Red House®, District® , CornerStone®, Nike, Ogio®, New Era®, Eddie Bauer® , The North Face® and Carhartt®. 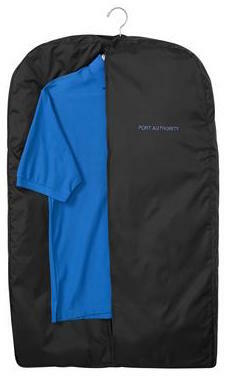 Sturdy, attractive nylon garment bags keep samples looking great while presenting a professional image. Choose from six designs that include Port Authority®, District®, Nike, OGIO®. Bags hold up to six samples. Call for pricing.